Home Local BREAKING NEWS <<< More troubles ahead Bahamas Downgraded by S&P again! BREAKING NEWS <<< More troubles ahead Bahamas Downgraded by S&P again! 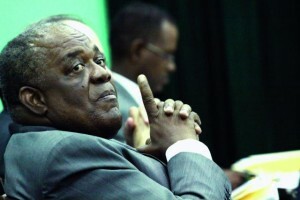 Hubert 'Papa' Ingraham set to send more public workers home. The Free National Movement Government is working for you and today once again news out of New York on the state of the economy and the bad economic outlook of the country continues to decline. Just today Bahamas Press, the first to pass on the information to readers, report the FNM Government is running the country into the ground as more and more businesses close and more workers are fired. The road project we continue to say is BAD FOR BUSINESS in the Bahamas and today’s announcement proves why. Read the S&P report, which gives the poor managers running the country a bad report card. 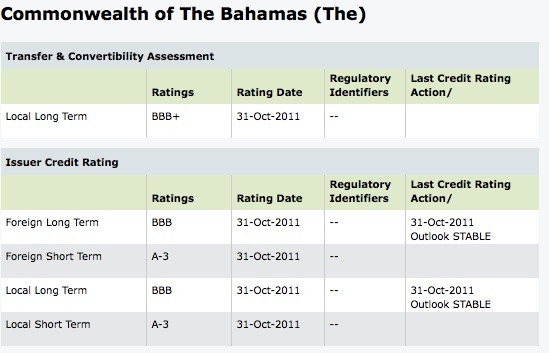 NEW YORK (Standard & Poor’s) Oct. 31, 2011--Standard & Poor’s Ratings Services lowered its sovereign credit rating on The Commonwealth of The Bahamas to ‘BBB/A-3’ from ‘BBB+/A-2’. We also lowered the transfer and convertibility assessment to ‘BBB+’ from ‘A-.’ The outlook is stable. The downgrade reflects the heavier weight that our recently revised sovereign rating criteria places on economic factors, which are relative credit weaknesses for The Bahamas. The Bahamas’ track record of political and macroeconomic stability has delivered high levels of per capita GDP, projected at almost $23,000 in 2011. However, the Bahamian economy is vulnerable to the country’s dependence on one sector, tourism, and one geographic market, the U.S. The stable outlook balances the risks associated with The Bahamas’ higher levels of government and external debt against our expectation for lower deficits and a generally stable external financing profile. The ratings could come under pressure if The Bahamas’ fiscal deterioration persists and the economic base erodes more severely. Conversely, we could raise the ratings if the government takes a more proactive policy response to reduce debt levels or if the Commonwealth’s economic prospects strengthen, more sharply improving the country’s external balance sheet. * The Commonwealth of The Bahamas, July 25, 2011. * Sovereign Government Rating Methodology and Assumptions, June 30, 2011. * Criteria For Determining Transfer And Convertibility Assessments, May 18, 2009. I’m still wondering why would we sell BTC the only Bahamian company putting millions of dollars into the Bahamas Public Treasure. Not only that now hundreds of people who had good paying jobs with excellent benefits are out of work. Last week some unknown international organization stated in their publication that the FNM will win reelection. That made front page news of the Tribune. Standard & Poor’s, one of the main credit rating agencies in the world, downgraded the Bahamas for a second time in 2 years, and it doesnt make the front page of the Tribune. As a matter of fact, they gave the story a small column in the business section, lol. Anyone see the irony in this? Lol. The Tribune has sunk to a new low! Not only that. When I saw the papers today, before even reading it I said the FNM has some bogus explanation as to why the Bahamas got that negative rating, and surely enough, bogus was an understatement. The FNM dude in the paper had the nerve to say he was expecting the rating because of some changes in the way Standard & Poor now conducts it’s reporting. When I saw that, I had to get another cup of coffee and shake my head while drinking! BP please follow up on the incident involving a fetal shooting of two bahamian males in ft. lauderdale. Bahamians will soon see how FOOLISH the decision to sell BTC to foreigners was.The export of the profits will go to the United Kingdom thus reducing our foreign reserves.If the government had sold BTC to Bahamians ALL the profits would stay in the Bahamas and the government could have used the proceeds to reduce the Bahamian component of the national debt. EVIL IS RAINING OVER GOOD. LOOK AT OBAMA THEY PUT HIM IN POWER THEN TIE HIS HAND BY VOTING IN THE REPUBLICAN SO HE STILL CAN’T DO CHIT, THE BAHAMIANS PUT CHRISTIE IN POWER IN 2002 AND NEVER ALLOW HIM TO FINNISH WHAT HE STARTED NOW THE ‘FREE NANNY MAN’ THEM F-ING UP THE COUNTRY AND GUEST WHAT? HE DON’T NEED BAHAMIANS TO VOTE FOR HIM HE GETTING ALL THE HAITIANS STR8. SO BAHAMIANS GET ANOTHER 5YRS TO EAT CHIT AND DIE SLOWLY BY THIS ‘FREE NANNY MAN’ GOVERNMENT…. Incompetent fools! Lying Mona Vie Laing and Devil Ingraham! You are shameless! You should resign or call election for failing the Bahamian people in so many ways! This proves that BOTH our ministers of finance,Ingraham and Laing are OUT OF THEIR LEAGUE.I have ALWAYS said that mr.HUBERT ALEXANDER INGRAHAM and his VOODO economics also known as INGRAHAMNOMICS are ABSOLUTE FAILURES!!! BP, you know i am not surprised right? There has been no economic activity in the Bahamas for almost 5 years. As a result unemployment has decreased a mere 1/2% in 2 years (so they say, lol). On top of that, rather than come up with some creative stimulus to help Bahamians, Mr Ingraham has given more work to foreign companies than Bahamians, thus working against himself and the people he is suppose to look out for. To make matters worse, as revenue from taxes decreased over the last 4 years, Mr Ingraham raised taxes on the middle class like never before to compensate. But at the end of every fiscal year his budget is overshot by $400-$500 million. While countries all over the world has been putting together some kind of stimulus to get their economies going, the FNM has simply decided not to do a dam thing until the US economy turns around because apparently, Bahamian governments cant think, do or help ourselves without the USA! And to add insult to injury, this same FNM government is now responsible for increasing the nations debt by 1/4 in 5 years. You have to be the blindest party loyalist, if you cant see how crapy Ingraham has handled the country and the issues that came about as a result of the recession. The foreigners know how bad the country is being ran. When will the people see it?